We utilize the most current technology in our industry. 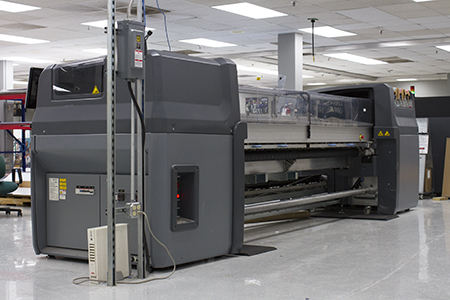 Our Print Lab includes a production floor of over 25,000 square feet of open workspace and an additional 5,000 square feet for front office and customer support. 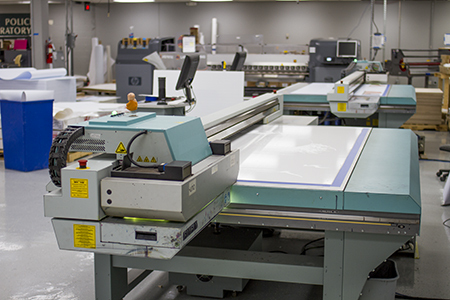 Currently, the shop floor includes an array of 8 large format printers from latex to UV Flatbeds and an arsenal of digital cutting and finishing equipment. The Kongsberg C cutting table is the very first multifunction large format digital finisher for signage, display and packaging applications. The Kongsberg C is designed to keep up with the faster, wider printers of today and tomorrow. 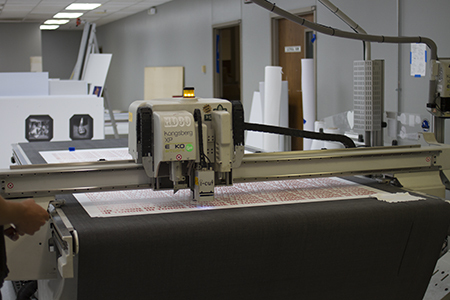 Exceeding the standards in versatility, precision and productivity, it has everything that Kongsberg tables are noted for, and more. The Agfa Jeti Tauro is a 2.5 meter wide high-end hybrid six-color plus white UV inkjet printer. Featuring extremely vivid printing and speeds up to 275 m² per hour, it sets new print quality and productivity standards on all kinds of media. FujiFilm Acuity UV Flatbed PrintersThe ultimate platform for printing on rigid, flexible and even roll media, delivering near-photographic quality images across a diverse range of creative print applications. Acuity Advance Select printers feature the latest technology to deliver superb performance. HP360 Latex PrintersWith production speeds ideal for handling urgent jobs, the HP Latex 360 Printer produces indoor and outdoor prints on a variety of traditional signage substrates including textiles. High-quality, durable prints provide scratch resistance comparable to hard-solvent inks. ESKO Kongsberg XP24 with Digital i-CutThe heavy-duty, high-speed and advanced ESKO Kongsberg XP24 brings a new standard in digital cutting tables. Its advanced engineering means it can handle even the most challenging materials with accuracy and precision. HP3100 Latex Roll-to-Roll PrinterProviding efficient high volume production and increased capacity, the new HP Latex 3100 Printer is the next chapter in high quality printing. With incredible high image quality at lightning speeds, we can meet growing customer demands for shorter deadlines, better quality and longer runs. HP Scitex LX 850 PrinterThe HP LX850 uses water-based inks and cartridges manufactured from 70% recycled material. The latex inks completely dry inside the machine so prints are immediately available for finishing. The LX850 is ideal for all substrates including paper, vinyl and fabrics. Outdoor prints have a 3-year durability without lamination. Mimaki CG-130FX Cutting PlotterIdeal for producing decals, stickers, cut-vinyl signs and more, the Mimaki CG-FX Series of roll-based cutters feature high speed, continuous crop mark detection for precise contour cutting. A proprietary half cut function leaves a small bit of backing sheet at connecting points for easier handling. An over-cut function makes a cross cut at the start and end positions, resulting in sharp edges with no undercut fragments. KIP C7800The KIP C7800 further expands the options for those that need presentation-quality engineering drawings. This machine can scan images for on-screen alteration, reduce and enlarge from 5% to 3600% and faithfully recreate images on 36" engineering bond. Featuring fully integrated automatic roll feed for ease of operation, mono-component toner technology and continuously fine copy quality, the KIP C7800 is simply the best high-speed, full-size engineering copier available.